Did I ever tell you I’m a special contributor to The Daily Meal? 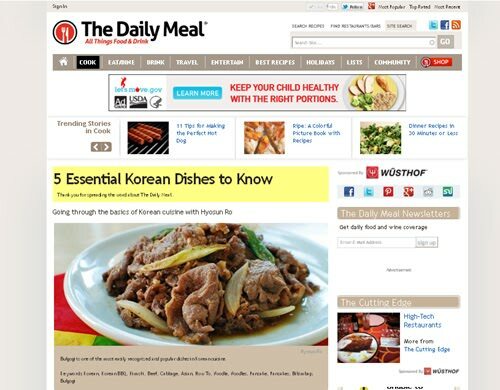 Today, I’m very excited to share my interview with The Daily Meal on the basics of Korean cuisine. I’m sharing the interview portion here, but please make sure to visit the Daily Meal and read the full article. For someone who is new to Korean cuisine, what five dishes would you suggest cooking? Bulgogi is the first one that comes to my mind. Bulgogi is one of the most well-known dishes. It is made with thin slices of beef marinated in a slightly sweet soy-based sauce. The same marinade can also be used for chicken or pork. 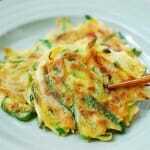 Pajeon is a savory Korean pancake made with scallions. This is also very simple to make. Throw in some scallions and seafood (usually a combination of squid, shrimp, mussels, oysters, and clams) into the flour-based batter and pan-fry until crispy. In no time, you’ll have one of Koreans’ favorite snacks/appetizers. Japchae is a traditional noodle dish made with sweet potato starch noodles (dangmyeon) as well as beef and vegetables. The cooking process seems involved because the ingredients are separately cooked to develop the layers of flavor, but each step in the process is very simple for this delicious and colorful dish. Bibimbap is another great dish to make. 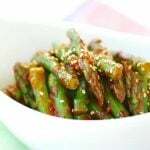 It’s basically a collection of several easy-to-make side dishes (banchan) using common vegetables such as spinach, cucumbers, zucchini, carrots, bean sprouts, etc. Again, the recipe does seem long, but it’s not difficult at all. This is a good way to learn how to make a few simple side dishes. No Korean meal is complete without kimchi. 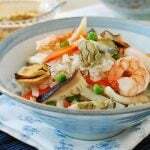 While the traditional Napa cabbage kimchi is not one of the easiest Korean dishes to make, there are many quick and easy kimchi varieties you can make with more common vegetables like cucumbers and green cabbage. 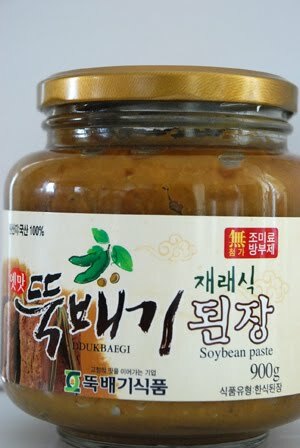 What are the ingredients a cook should keep in the pantry (and in the fridge) that are essential to many Korean dishes? It’s a good idea to always have some gochugaru (Korean red chile pepper flakes), gochujang (Korean red chile pepper paste), doenjang (fermented soybean paste), soy sauce, sesame oil, and rice wine. For the first three ingredients, you’ll need to make a trip to a Korean market or buy online. For authentic flavors, there simply is no substitute for them. These days, you may be able to find the other ingredients at your local grocery store. Also, garlic, ginger, scallions, and onions are very important for Korean flavors, so always keep them on hand. Finally, I always keep dried anchovies in my freezer. Dried anchovies are used to make stocks that serve as a flavor base for many Korean soups and stews. What are some techniques that cooks should be familiar with to be successful with Korean cooking? Similar to Western cooking, blanching, stir-frying, braising, and grilling are all very common in Korean cooking. Korean vegetable side dishes are mostly blanched and/or stir-fried. 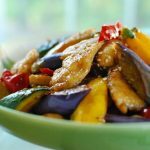 With these two techniques you’ll be able to prepare many delicious vegetable side dishes. Braising is also a technique traditionally used for main dishes like braised beef short ribs (galbijjim) and braised chicken (dakjjim). 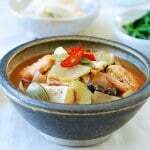 Many side dishes are also braised, such as braised tofu (dubu jorim) and braised potatoes (gamja jorim). Can you describe the typical flavor profiles in Korean cuisine? Korean food is known to have bold and spicy flavors, kimchi being most representative. There are also plenty of dishes, like rice cake soup (tteokguk) and milky beef bone soup (seolleongtang), that not only are mild but also subtle and complex, relying on well-developed stocks. Typically, a wide variety of flavor combinations plays into Korean cuisine. The saltiness comes from various sources (salt, soy sauce, fermented soybean paste, fish sauce, etc. ), and often the saltiness is countered with slight sweetness, in dishes like bulgogi and galbijjim. A small amount of sugar is used in many other dishes to round out the saltiness or heat. Another important flavor combination is salt and acidity. This is achieved by adding some sort of vinegar or through the fermentation process as in kimchi. In most Korean dishes, garlic, ginger, sesame oil, and chile peppers play an important role. It seems like Korean home cooking tends to require a fair number of ingredients and a good amount of prep. Are there any shortcuts you use on a day-to-day basis? Most Korean dishes are actually very flexible! You can easily omit or replace certain ingredients in the recipes without compromising the authenticity of the dishes. For example, my bibimbap recipe uses seven toppings, but sometimes I only add three or four toppings, depending on what I happen to have in the fridge. It’s still delicious! As far as saving time, when I make stock (beef, chicken, or anchovy) I make much more than I need and freeze the rest. This comes in handy the next time I need stock. I also make other dishes, such as soups, marinated meat, mandu (dumplings), etc. in large quantities and freeze them for a quick meal in the future. A mandoline or food processor can also help cut down on prep time. Korean cooking tends to require a lot of chopping, slicing, or cutting into matchsticks, but those kitchen tools can definitely help speed things along. What a great interview. I enjoyed reading and now I am going over at Daily Meal to read the other portion of the article! This is exciting, Hyosun! Congratulations for your interview. Very informative and well explained. Hi Hyosun! Congratulations on an enlightening and beautifully done interview!